Gauri Bharat is Chair of Architectural History and Theory Program at the Faculty of Architecture, CEPT University, Ahmedabad, India. Her teaching and research focus primarily on how people engage with the built environment. She explored this in her PhD, which analysed Adivasi built environments as an archive of their history. The project not only demonstrated what architectural change can tell us about the social, environmental and historical lives of such communities, but also reflected on the role of research and history in shaping personal and collective identities. Additionally, for the past few years now, Gauri has been fascinated by the oddities and untold stories of Indian cities. She has experimented with teaching architectural history, theory and humanities using the city of Ahmedabad as a laboratory. Her students have mapped cows, roadside shrines, fruit and vegetable markets, temporary markets, and roadside eating habits, among other things. By immersing themselves in the seemingly mundane but actually complex urban phenomena, her students learn to make sense of built environments as both sites and processes. Gauri continues to do research in the ways in which people produce, inhabit and transform built environments, be it the street culture of Ahmedabad or in the rural areas of Jharkhand. 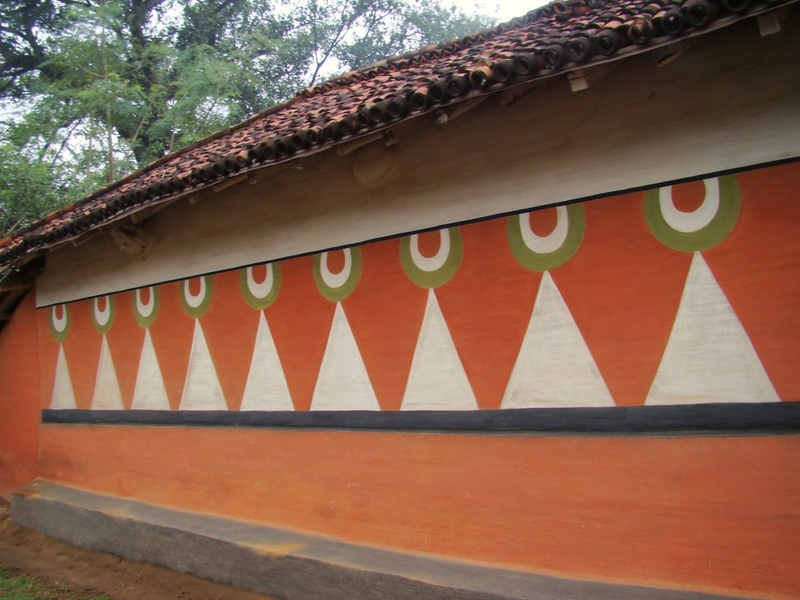 Mud murals are an integral part of the domestic architecture of Jharkhand in eastern India. Mud has been used as a building material since ancient times and continues to be the primary material for the making of rural dwellings in many parts of the world. It requires regular maintenance including annual repair and plastering. This among many communities becomes an occasion for producing elaborate designs in the form of murals. In order to understand the process of making mud murals, one must first understand the process of mud construction. The walls of rural houses are built typically using murrum mati (the locally available clayey soil) to which material such as small stones are added for bulk and strength. Murrum mati is soaked with water and kneaded very well to bring out its adhesive properties. Lumps of the prepared material are placed and shaped in the profile of the wall by hand. The wall is built up in this manner layer by layer. In certain areas where stone is more easily available, the wall may be built mostly with stone with the murrum mati acting primarily as mortar to hold the stone together. Once built upto a height of approximately 2.5 metres, the roof structure is added. Once that is completed, the wall surfaces are covered with a plaster made of finer murrum mati (from which any small pieces of stone have been removed) mixed with plant material such as bits of straw or paddy husk. This prevents the surface of the plaster from developing cracks later. Once the plaster is dry, the surface is smoothened by scrubbing it with a piece of stone and it is ready for painting. Different regions and communities have different traditions of design (as discussed in the overview article). The tools and techniques of painting also vary. Seven different mural processes are described below. The nomenclature of the mural practices is broadly descriptive of technique or community since there are varying degrees of similarity and difference between the practices. 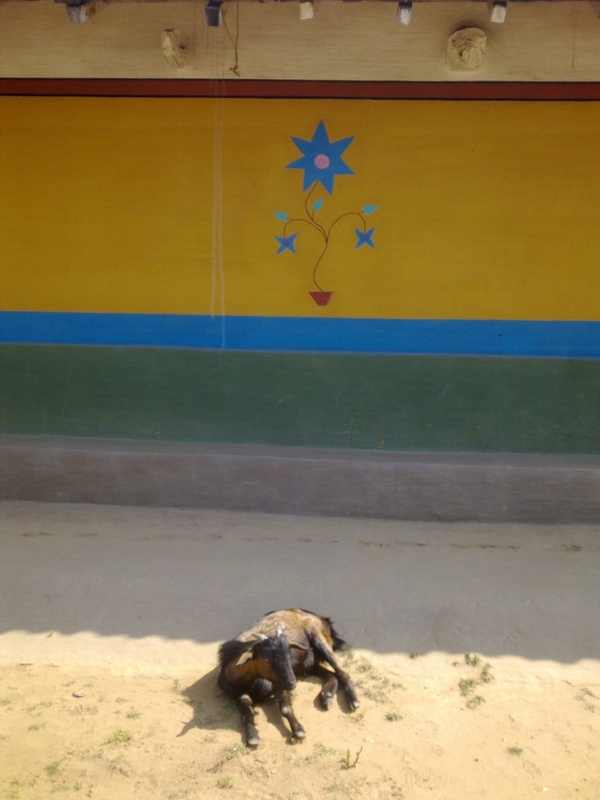 The basic mural design scheme in Singhbhum in south Jharkhand is horizontal bands of colour. 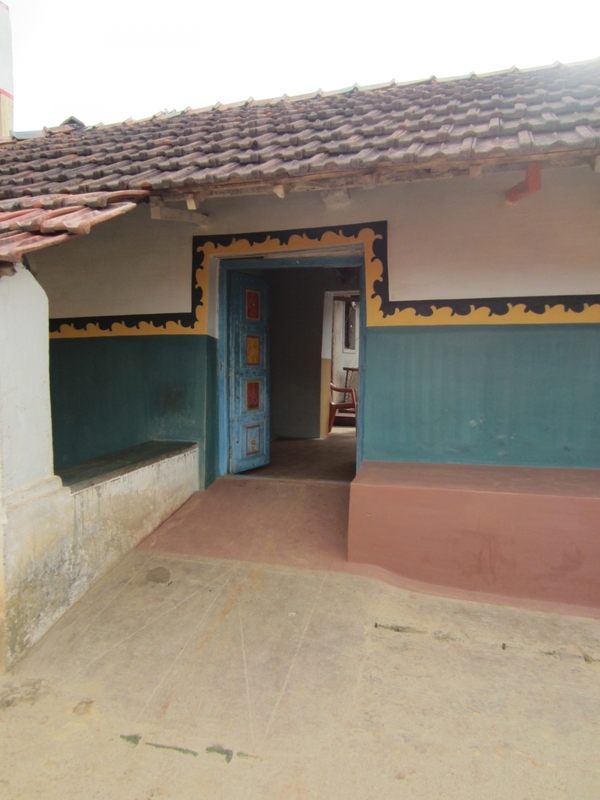 Communities such as Mundas or Mahatos use two or three colours, usually black at the base of the wall, followed by red and white towards the top of the wall. Santal houses however are more brightly coloured. Once the wall surface is ready, lines are drawn to demarcate the bands of colour using lengths of string that are held taut against the surface of the wall with nails. Lines are then traced along the stretched string. Meanwhile, the coloured clays which are to be used are mixed with water in preparation for painting. A piece of cloth is dipped into the colour and applied on the wall using horizontal strokes. The women start at the top of the wall and then move down to the base, working in vertical blocks until the entire wall is painted. The women artists take great care to produce a very evenly painted surface and precise edges between two colours. Occasionally some details such as a line of flowers or small decorative motifs are added in a few places such as the the front door or in thin strips between the bands. 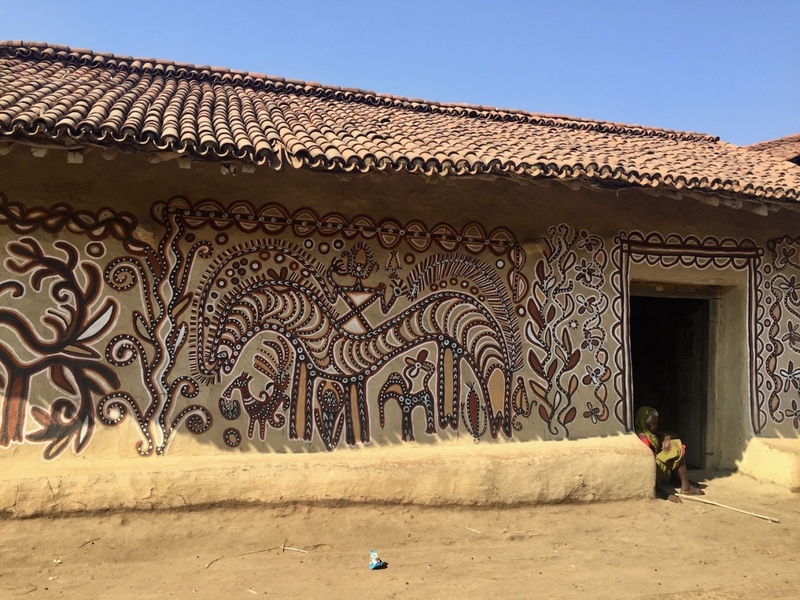 In some Santal villages in the Seraikela region, there has emerged a practice of adding elaborate shapes or intricate motifs within the horizontal bands of the mural. A key difference between such murals and the simple bands is of the painting tool. The use of the paintbrush enables the painting of finer details, whereas painting with a cloth only produces large swathes of colour. Thus women paint complex geometric compositions comprising basic shapes juxtaposed onto one another, or add natural motifs such as flowers and insects. Such murals typically take longer to execute. Since women have to balance their domestic and agricultural responsibilities in order to complete a mural, it is likely that elaborate murals are produced by women who are able to hire labour to assist with their other responsibilities. Unlike the designs in Singhbhum, Santal women in Hazaribagh paint lengths of geometric patterns and have a slightly more restricted colour palette that is typical of the region. Zigzag lines in red and black, for instance, are added along the length of the wall. These are painted using the cloth, but here too the women pay particular attention to achieving very precise edges in order to produce a neat mural. Compared to the other types of mural practice in the Hazaribagh region, Santal murals are distinctive for their sharp geometry. 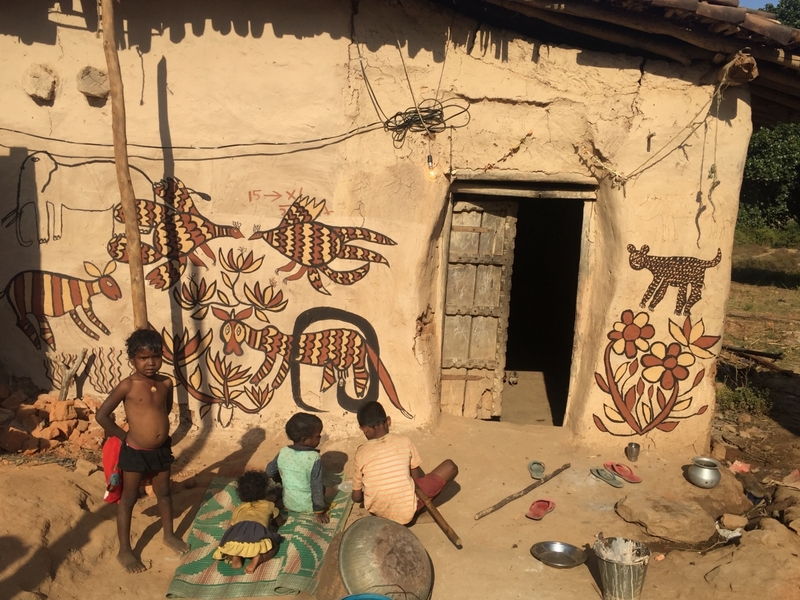 One of the more unusual practices, found in very few villages in Singhbhum, involves the carving of mud columns and then painting them in bright colours. A complex technique, this involves the making of a column by stacking layers of mud, and then carving it into desired shapes after the mud has set. The column is then plastered following the regular process described earlier. 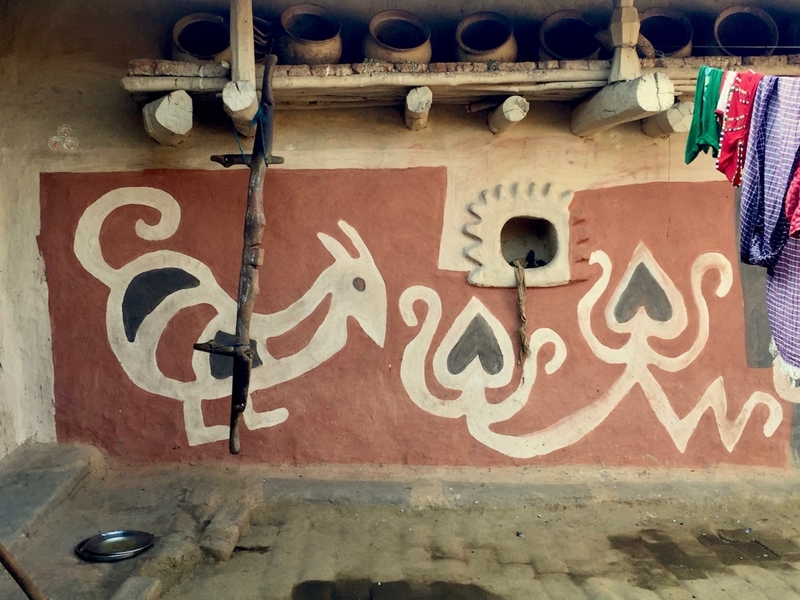 While these are not strictly murals, the process is clearly part of the gamut of decorative practices for mud houses. It is also interesting to note that the carving of the mud walls is usually done by men, while the painting is done by women, making this practice an exception on account of the gendered roles involved in its making. 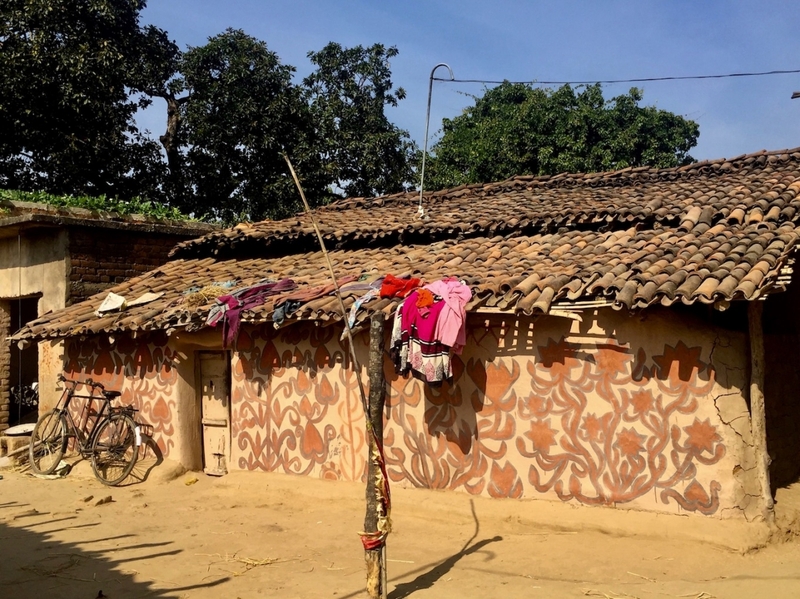 Many communities in the Hazaribagh region follow traditions of painted murals that are distinctively different from the geometric Santal murals discussed earlier. One category of paintings is known as khovar (kho meaning room and var meaning bridal couple) in reference to the bridal room or the occasion of a wedding when such paintings are made. The other type of mural is known as sohrai and refers to paintings made on the occasion of the annual harvest. Depending on the community, the painted murals depict flowers, plants, animals or ritually significant forms such as Pashupati (the lord of animals) and the mythical tree of life. The motifs vary from village to village and across communities but the basic technique of painting is broadly the same. The surface of the wall is first covered in the dark (almost black) manganese-rich clay, which affords the mud wall some protection against the weather. This surface is then covered with a light brown or white kaolin clay. 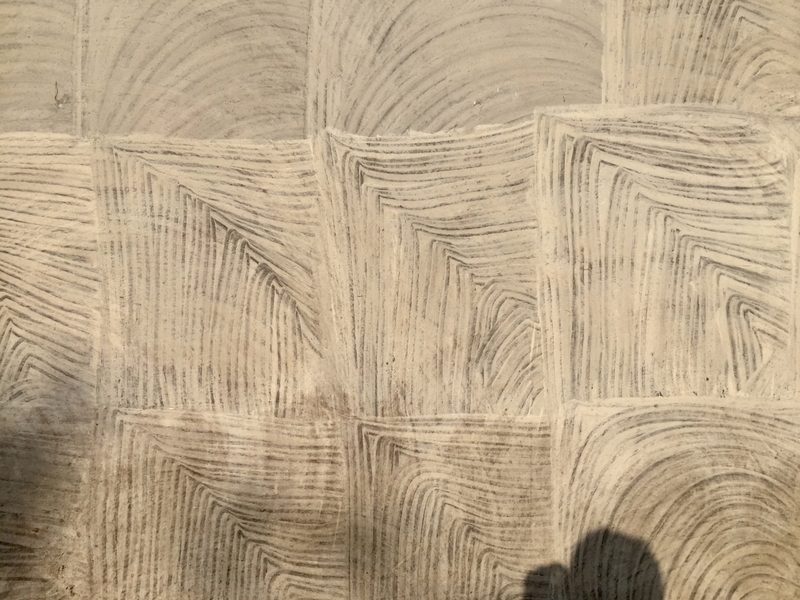 Occasionally, the kaolin clay is applied by hand in a square block and the motion of the fingers produce patterns of straight or curved lines. 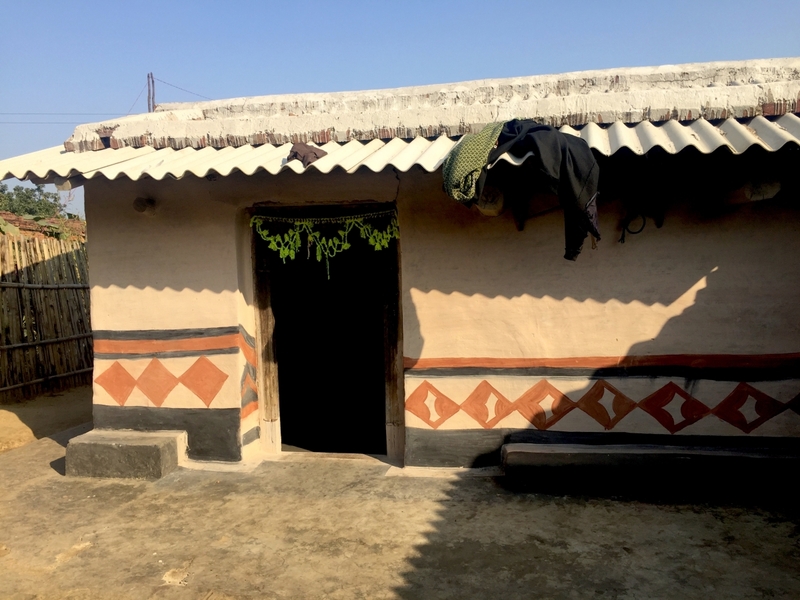 Jharkhand mural art expert Bulu Imam suggests that these patterns carry ritual significance and symbolise the house itself. Once this surface is prepared, the motifs are painted in red, ochre and black. In case of elaborate designs such as the Kurmi art (see Fig. 9), the designs are first drawn on the wall using a nail or similar sharp object. After this, the designs are painted using a brush made of the previously chewed twig of the neem tree (azadirachta indica), or a piece of cloth dipped in colour if the motifs are reasonably large in size. Women artists of the Ghatwal, Agaria, and some Kurmi communities paint murals using a stencil-type method, described as glyptic by Bulu Imam. The wall is segmented into large rectangular panels when the kaolin clay layer is applied. Then, using a darker red or black clay, women paint the negative spaces within the panel, leaving some areas white which form the animal or plant motif. The technique is complicated since it requires the artist to visualise and paint not the motif but the space surrounding it. Amateur artists create an outline of the motif using a second layer of kaolin clay and then add the darker clays in the surrounding areas. Comb-cutting of clay is an unusual practice carried out by Kurmi women in some villages around Hazaribagh. The women artists first apply a layer of black manganese clay to the wall, and then apply a second layer of whitish kaolin clay. When the second layer is just set (but not fully dry), women scrape out lines in the wall and create designs. Elephants, big cats, deer, peacock, and floral designs are common designs created in this manner. The final mural is a subtle work in the muted colours of the natural clays. While the demands of household chores and agricultural activities are affecting the production of murals, the efforts made by Bulu Imam’s organisation Sanskriti, and Justin Imam’s organisation Virasat are slowly paying dividends. With regular visits, discussions, and assistance with procuring materials, some of the more proficient women artists have begun to train and encourage their younger family members and other women in the village to paint murals in their houses. The results show in some villages such as Oria, Jorakhat, and Daujinagar where most of the village houses are now covered in murals. Bharat, Gauri. 2015. ‘An Enquiry into Santal Wall Painting Practices in Singhbhum, India’, Journal of Adivasi and Indigenous Studies 2.1:35–50. Online at http://joais.org/papers/vol2no1/3.%20Gauri%20Bharat%2035-50.pdf (viewed on April 2, 2018). Imam, Bulu. 1995. ‘“Bridal Caves”: The Search for the Adivasi Khovar Tradition’. New Delhi: INTACH. ———. 2009. 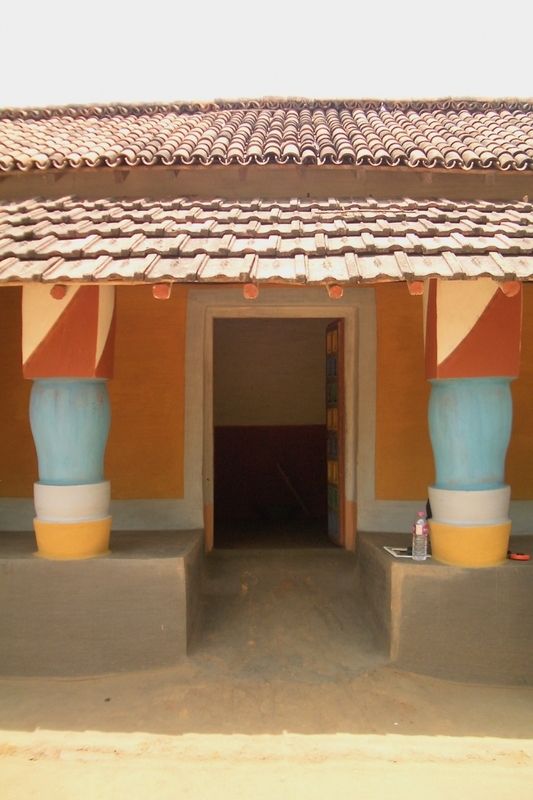 ‘Kovar and Sohrai Art: The Painted Houses of Hazaribagh’ in Heritage India 1.4. Rycroft, Daniel. 1996 . 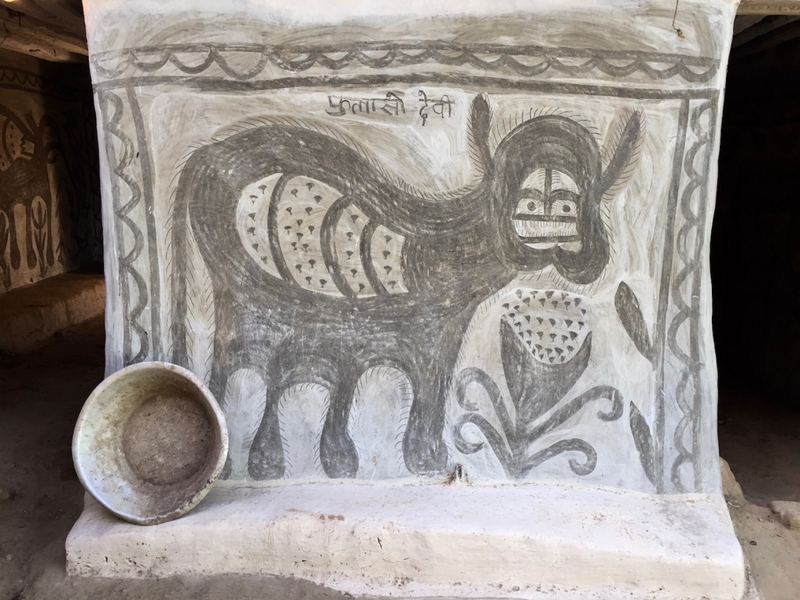 ‘Born From the Soil: The Indigenous Mural Aesthetic of Kheroals in Jharkhand, India’, South Asian Studies 12.1:67–81.